Honey LuLu is an international showgirl, who has teased and entertained audiences around the world. Her shows are a heady cocktail of dazzling costumes, beautiful props, sass, irony and a smile that will win any audience. Honey LuLu’s repertoire of classic burlesque shows evokes the glamour of long gone eras: she is inspired by the queens of burlesque’s golden age of the 1940s and vintage fashion. With stylish costumes and a commanding stage presence, whether bathing in a giant teacup or frolicking onstage with a perfume bottle, she will steal the show. Honey LuLu is always developing new acts, and is happy to take on bespoke acts for special-themed events. She is also available as a walkabout character to spice up your event. Honey Lulu’s legendary show as featured on MTV! In a dazzling English Rose costume, she proceeds to disrobe in order to bathe in milk in her giant teacup. An act not to be missed which continues to make the burlesque headlines! Gentlemen, have you ever wondered about the mysteries that hide in ladies’ purses and bags? In this spectacular new show Honey Lulu reveals such secrets. The show was inspired by a lovely little bag and the obsession some of us girls have with shoes and bags. Sparkly as ever, Honey Lulu dazzles the audience coming out of a giant handbag with a truly classic striptease inspired by the burlesque queens of the 1950’s. This show can be also performed without the handbag but requires the availability of a sofa. A very classic 1940’s femme fatale glove and dress striptease, followed by a beautiful dance with a 10ft ostrich feather boa and a champagne shower. Honey Lulu wears an original 1940’s Hollywood sequined showgirl dress and some spectacular feathers. Dressed in a classic diva ostrich feather robe our Honey is getting ready to receive her lover but after powdering herself she gets lost in the music and performs a very charming striptease. White fan dance with a showgirl costume. This can be also performed as a double fan dance. Fan dance music can be tailored to client’s needs. Just a spoonful of sugar makes the medicine go down…You will never watch ‘Mary Poppins’ in the same light again! 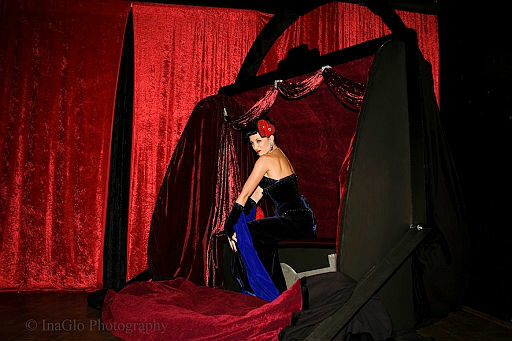 A popular comedy burlesque number often complete with spontaneous public sing-a-long! This exhilarating act combines comedy and glamour. Honey Lulu is mourning her husband who, as we find out, has left her a substantial inheritance. The mourning coat comes off and as more and more garments are removed, we see that more and more money is to be found. Honey Lulu is clad in a sophisticated black costume encrusted with Swarovski crystals. Part B-Movie, part sideshow, in this show Honey LuLu is a mysterious lady who is not afraid of ‘shakin’ it’ and likes to play with fire. After shedding her beautiful midnight blue costume, Honey LuLu performs a sensual fire routine of body burning, dancing with her torches and fire eating. Not for the faint hearted!